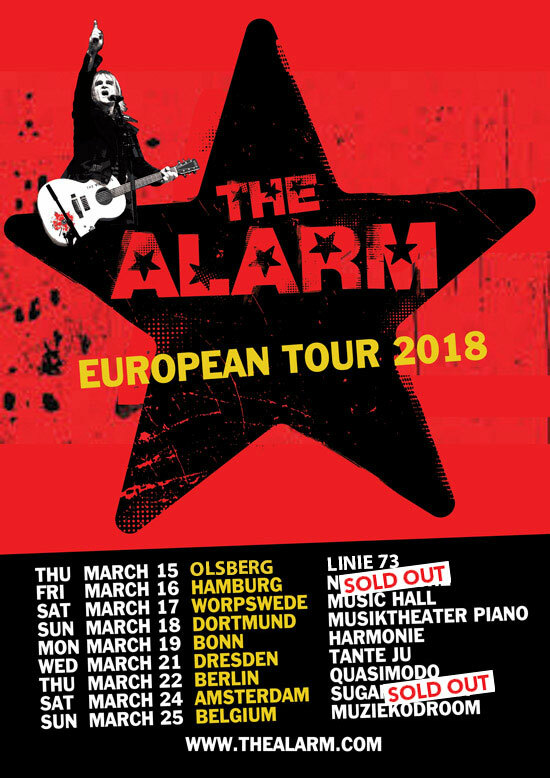 The Alarm will embark on their first major tour of Europe in over a decade with concert dates in Germany, Belgium and Holland. The shows in Hamburg and Amsterdam have already SOLD OUT in advance. The Alarm will be performing a European setlist that will feature classic tracks from the band’s illustrious history – ‘The Stand’, ‘Sixty Eight Guns’, Strength’, Spirit Of ’76’, ‘Rescue Me’, and more including a 30th Anniversary performance of the band’s perennial ‘Rain In The Summertime’. In 2017, The Alarm completed a massive 55 date tour of the USA with many of the shows selling out, creating a surge of affirmative reviews enhanced by the US release of feature length film – Man In The Camo Jacket that was premiered at the prestigious Grammy Museum in Los Angeles on August 3rd and tells the remarkable story of love, hope and strength that is Mike Peters and The Alarm. Remastered and expanded version of the bands fist recorded music ‘Eponymous 1981-1983’ and ‘Declaration 1984-85’ are both being released on CD / LP and Digital, to coincide with the March Tour in 2018 along with a Mastered For Itunes (Digital Only), version of the modern compilation ’21 [Redux]’, which has been expanded to 29 tracks and features all of the post 1980’s singles. Pre-order here.